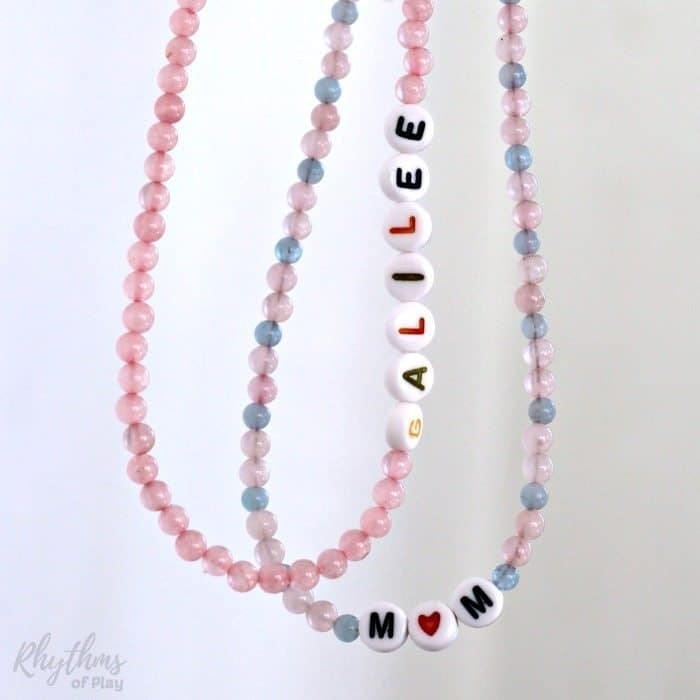 Making mother-daughter jewelry is easy with alphabet beads! A Mother-Daughter Necklace Set makes a simple handmade gift for Mother’s Day, a birthday, or Christmas. You can even make mother-daughter bracelets instead of necklaces using the step by step jewelry making tutorial. Of course, you can make necklaces or bracelets for every member of the family if you wish. DIY name necklaces make a great gift idea for Christmas or a birthday. Learn how to make mother daughter necklaces and bracelets with the step jewelry making tutorial below. There are three simple ways to start and finish a necklace or bracelet for this project. Infinity, clamshell knot covers, or crimp beads and pliers. Choose the type of materials that you will need based on the method that you will use. Click the link above to learn more about each method. Thumbprint heart necklaces and fingerprint flower necklaces also make great gift ideas and are easy to make into DIY mother-daughter necklace gift sets. 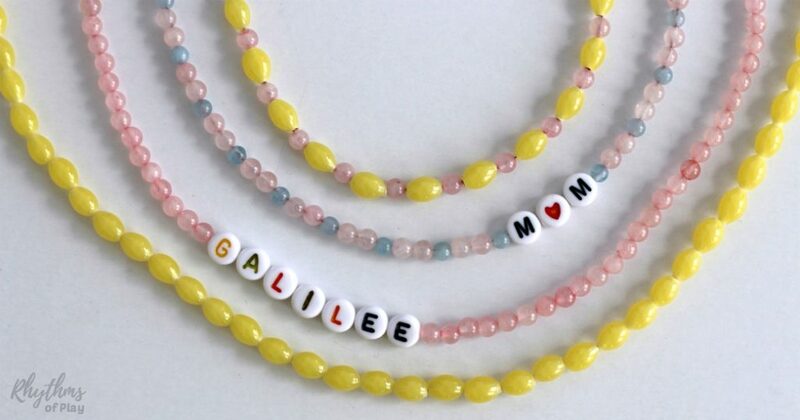 We used 8mm round gemstone beads for this project because they look the best with the alphabet beads. 8mm Faceted beads would work just as well. 10-12mm round gemstone beads may be better if you are assisting a child that has never strung beads with this project. There are a lot more gemstones available besides the few that I have listed below. Some of the links provided have more than one gemstone option available. Click through to see them all. In order to make DIY mother-daughter jewelry, you will need to start with my handy dandy tutorial that shares three easy ways to start and finish beaded necklaces; infinity, clam-shell knot covers, and crimp beads. Click on the link to learn which technique you’d like to use for this mother-daughter necklaces jewelry making project. Finish your mother-daughter jewelry using the same jewelry technique that you started your necklaces with. You can find the tutorials in 3-ways to start and finish a beaded necklace or bracelet. 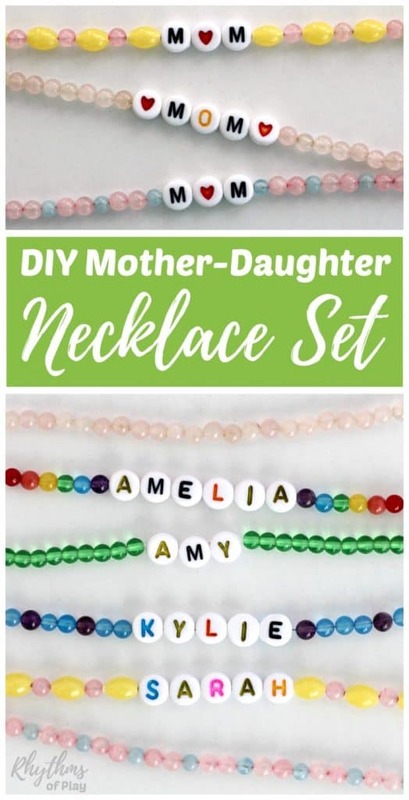 DIY Mother-Daughter necklaces make a beautiful homemade jewelry gift set perfect for Mother’s day, Christmas or a birthday. Thumbprint heart necklaces and fingerprint flower necklaces are also really easy to make into Mother-Daughter necklace sets! You may also like this awesome collection of gifts kids can make.